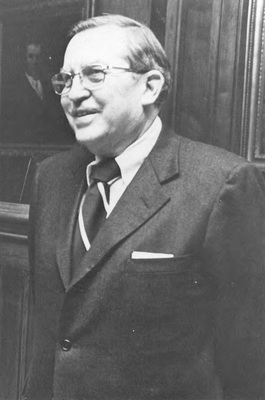 William B. Spong, Jr. became Dean and Dudley Warner Woodbridge Professor of Law in 1976, having previously served as a U.S. Senator for Virginia and as a delegate and senator in the Virginia General Assembly. He graduated from Hampden-Sydney College in 1941 and received his LL.B. from the University of Virginia in 1947. Spong began his deanship at a difficult time for the Law School, when it was faced with inadequate physical facilities and the threat of decertification by the ABA. Spong oversaw the construction of a new law school building and guided the school into national prominence. He retired in 1985. William Spong's publications are available here. Farewell, William B. Spong Jr.
Introduction to National Security and the First Amendment, William B. Spong Jr.
A Letter from the Dean (1984), William B. Spong Jr.
Introduction to Defamation and the First Amendment: New Perspectives, William B. Spong Jr.
A Letter from the Dean (1983), William B. Spong Jr.
A Letter from the Dean (1982), William B. Spong Jr.
Book Review of War Powers of the President and Congress: Who Holds the Arrows and Who Holds the Olive Branch?, William B. Spong Jr.
A Letter from the Dean (1981), William B. Spong Jr.
A Letter from the Dean (1980), William B. Spong Jr.
From the Law Schools: A Look at Lawyer Competency, William B. Spong Jr.
A Letter from the Dean (1979), William B. Spong Jr.
A Letter from the Dean (1978), William B. Spong Jr.
Letter to the Alumni of the Marshall-Wythe School of Law, William B. Spong Jr.
President's Page, William B. Spong Jr.
Report of the Past President, William B. Spong Jr.